Cubic is a type of projection for mapping a portion of the surface of a sphere (or the whole sphere) to flat images. The images are arranged like the faces of a cube and are each one in the Rectilinear Projection. This cube is viewed from it's center. Four cube faces cover front, right, back and left, one the zenith and one the nadir, each of them having 90°x90° Field of View. In each cube face all straight lines stay straight, hence it is very good for editing. See extracting and inserting rectilinear Views on different possibilities how to extract cube faces from an equirectangular image and inserting them again. 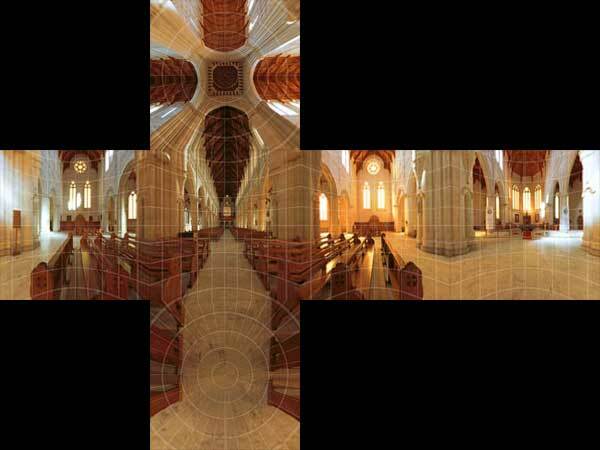 Images in the Cubic projection are commonly used as the image source by several spherical panorama viewers, including SPi-V and Quicktime. This page was last edited on 18 November 2007, at 00:38.